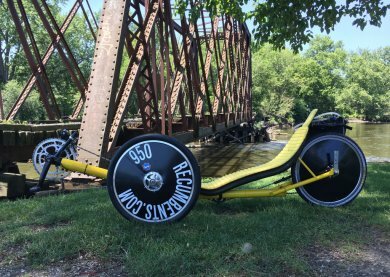 Warren Beauchamp's recumbent bicycle and human powered vehicle (HPV) web site! This web page will document building of a mostly steel recumbent racing trike. Before I build the CF version, I want to build a version out of steel to work the bugs out of the design. I'm going to use the frame and parts from the Street racer 2 bike. I don't ride it and nobody wants it so it's now a donor bike. 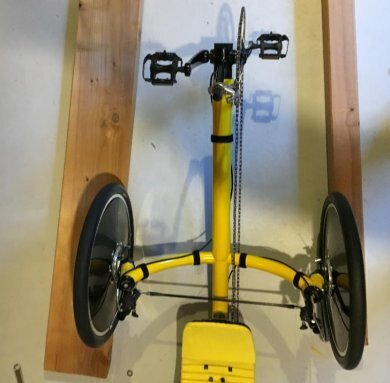 Front wheels will come from the tilting trike. I'll use a CF seat that is left over from another bike. I'm going to try to keep the geometry the same as the CF version. 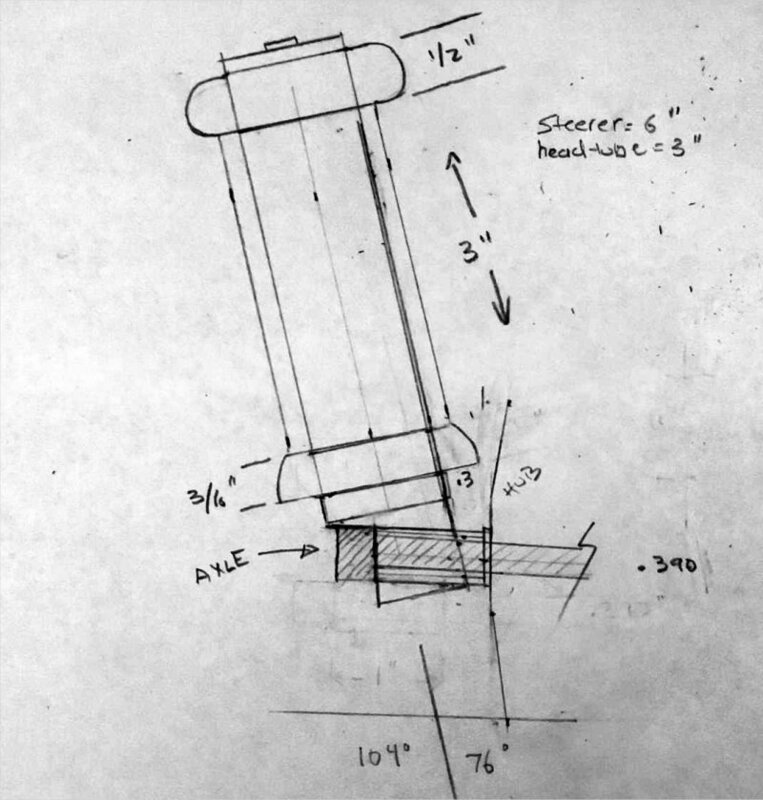 After a bunch of measuring, here's the 1X drawing of the kingpins. Kingpin inclination is 76 degrees, for a 406mm wheel with a medium width tire. Steerer tube is 1 1/8" OD, the head tube is 1 1/2" OD. Here's the frame layout drawing. 44" wheelbase. 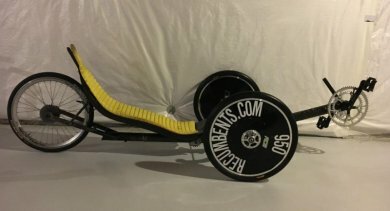 5" seat height. 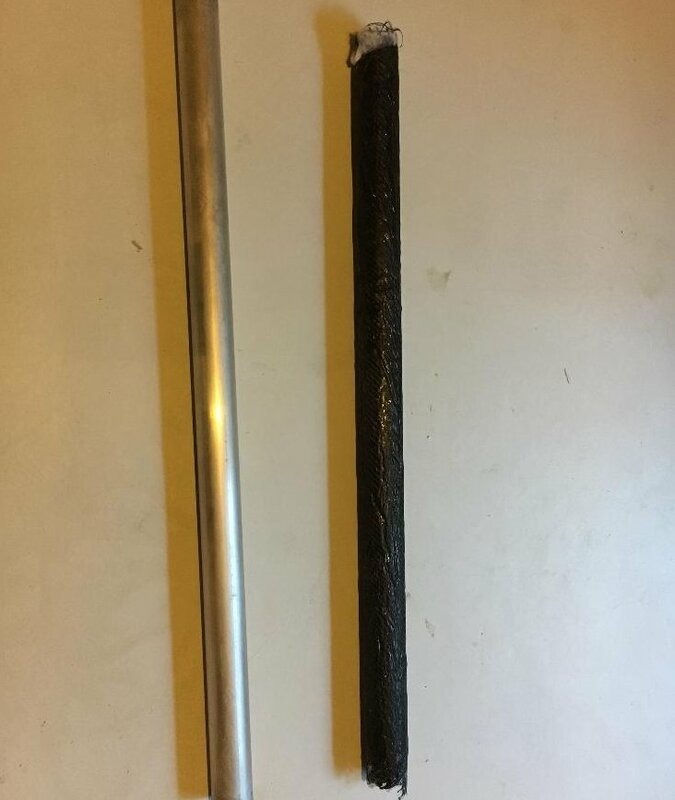 14" BB height. 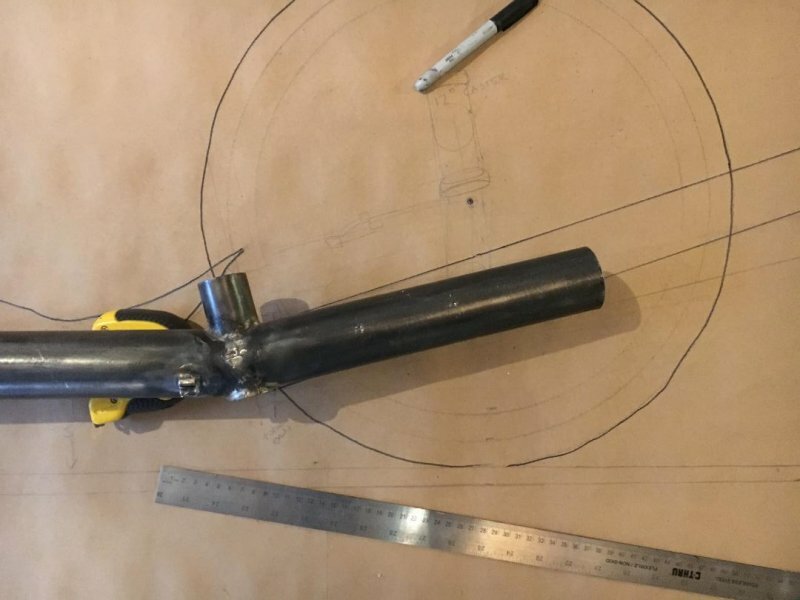 Trying now to figure out if I can fab up CF tubes that will clamp over my 2" tubes so I don't have to use heavy 2" x .049 tubing for the boom and bottom tubes. I bought some shrink tube sleeves to compress the CF layups evenly. It took 5 hours to cut, mitre, jig, tweak and braze this joint. And it's off. How far off? Looks like the BB will be at 10.5" now instead of 14" as planned. 6" crank length plus 7.5" of shoe = 13.5" to the ground with foot hanging straight down at the bottom of the pedal stroke. Apparently my plastic angle measuring tool is not good for low angles. Fortunately your foot doesn't normally hang straight down at the bottom of your pedal stroke. I measured on my bike and it looks like I need about 10" of ground clearance while pedaling normally. Hmm. I'll try it and have to tweak it a bit if it's not enough clearance. I don't have a lathe so I had to fake it with concentric tubes. 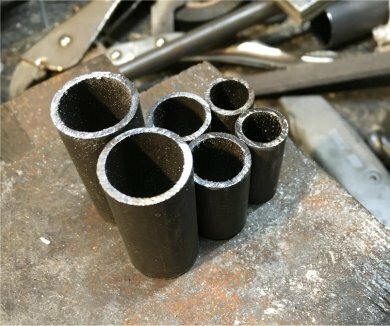 The holes in the sides of the tubes are to braze the tubes together. 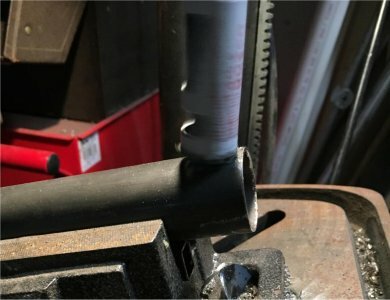 I was able to create the proper angle hole in the steerer tube with a 3/4" holesaw. To make the bearing seats I used 1-1/4" x .058" tubing to fit over over the 1-1/8" steerer tube. Brazed in the bearing seats and the shims for the lower bearing race and then did a test assembly of the headset assembly. So far so good! Made the 1X cruciform drawing. If I make the cruciform tubes straight my thighs may hit them, so I'm going to try to bend them. Looks like I need to order some 1.5" thinwall tubing for the cruciforms. I thought I had some but it's heavy .058 wall. 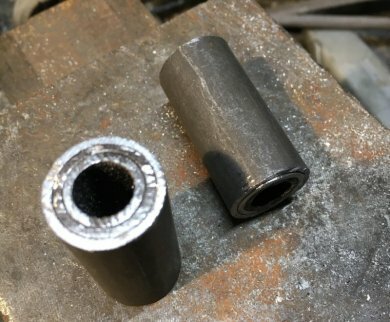 The 1.5" x .035" tubing arrived, and I stuck it in the tubing bender. Here's my tube bending demo video. After some work, the tube is bent to the correct diameter, yay! I had cut the wrong sized hole in the boom tube for the cruciform, which basically ruined that tube. That's probably a good thing because it forced me to cut it off and make a new one that is actually at the right angle. 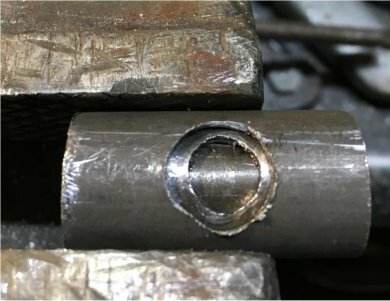 This picture shows the boom stub tube tacked onto the main frame, with the correct size hole cut into for the cruciform tube. Here's the cruciform tube inserted into the jigged up frame to eyeball it. Looks fine. I made the fish mouth cuts into the cruciform tube, at the correct angle of 76 degrees to match my kingpins. 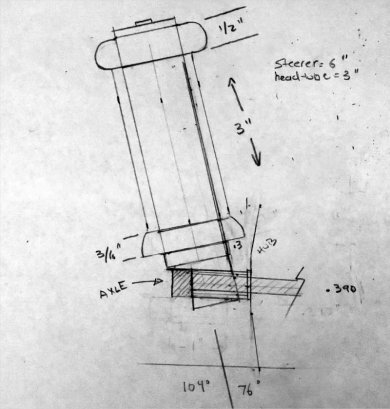 To provide the correct caster (trail), the cruciform will be angled backward at 12 degrees. This should look fine as it will be about 90 degrees to the boom tube. All the tubing holes and fishmouth cuts were done in my drill press. Yesterday I tack-brazed the kingpin head tubes and the cruciform in place. Yes, I had to do a bunch of measuring and re-measuring to make sure it was all straight, but I didn't build a special trike jig. I hope i don't regret that decision! Today I added the wheels and eyeballed it and did some measurements to make sure all the angles are correct. It looks pretty good. Finished brazing the steering tubes to the cruciform. Measured the ackerman angles (15 degrees). Cut and brazed up the steering brackets with stubs for the drum brakes and 6mm T-nuts to attach the steering linkage and added them to the kingpins. Reassembled the headsets and re-added the wheels to check out how it looks. Meh. 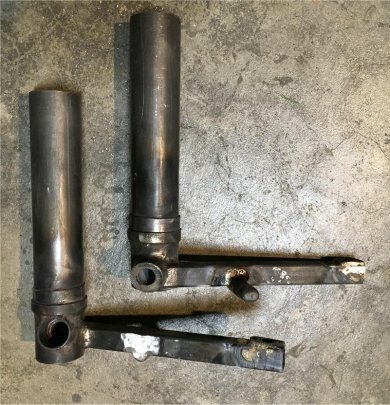 Apparently I shouldn't have finished brazing the steering tubes to the cruciform. I will need to unbraze the left headtube and tweak it a bit as the wheel is not quite vertical. This will also fix the rear wheel being not quite vertical. Sigh. 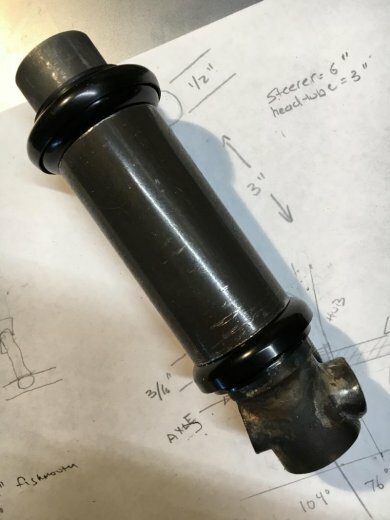 Ordered the 6mm rod end bearings. 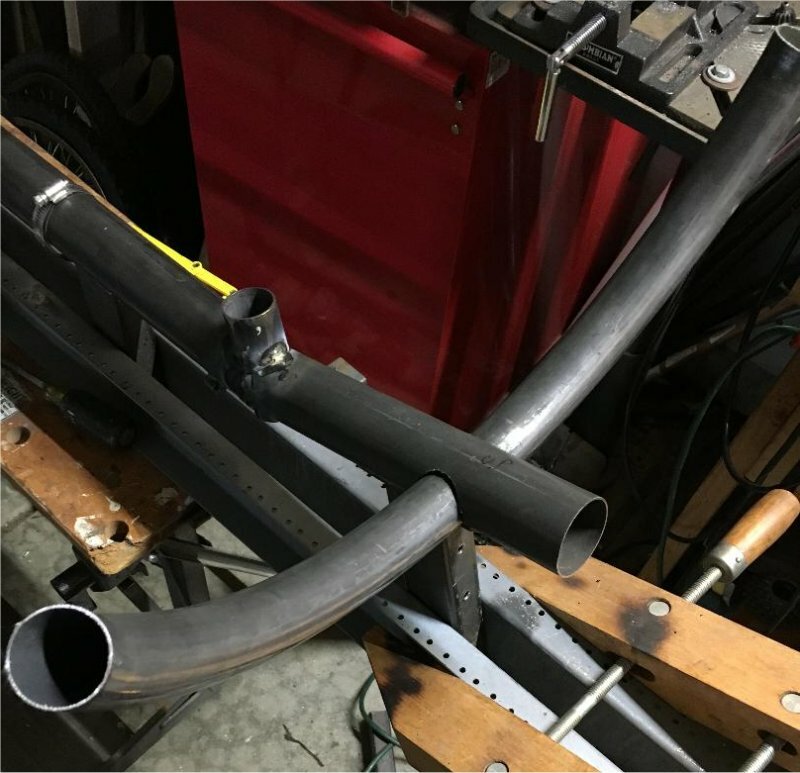 Actual track width - 27"
I brazed up the rest of the frame tubes and trimmed the steerer tubes. Laid up some steering related CF parts. I found a CF steerer in my parts bin and made a CF clamp sleeve to connect the steerer tube to the riser tube. 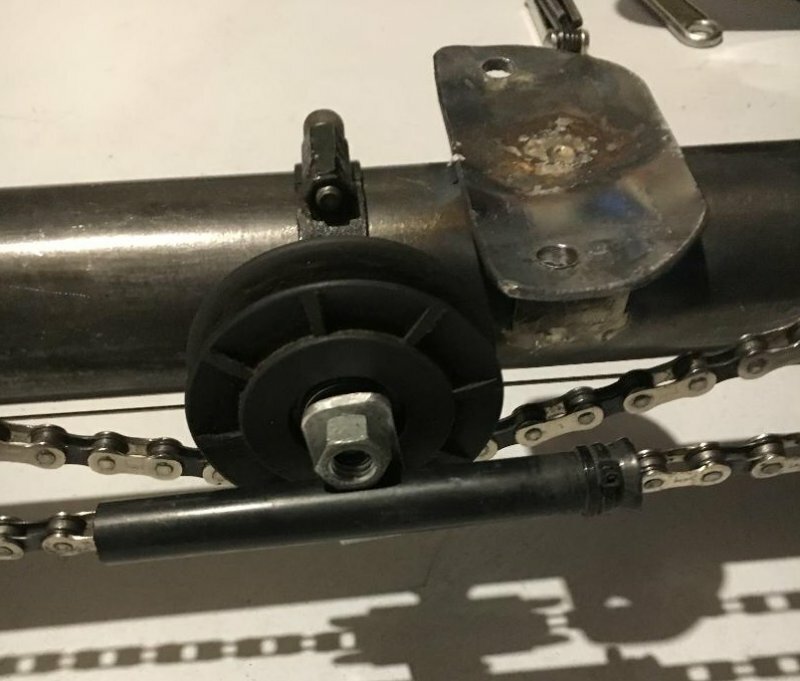 This pic shows the CF tie rod, steerer tube clamp, steering bell crank and steering rod. Tom noted that the steering is backwards. Crap. With this design you turn left and the trike goes right. Back to the drawing board. It's also time to make the CF boom tube. 6 layers of CF in the boom will make it about 1/8" thick which should be plenty thick enough. I have clamped the 2" OD aluminum tube into a bike stand and waxed it up. 3) Cut 36" x 36" chunk of CF. 4) Coat tube in epoxy so CF will stick to it. 5) Repeat until complete, try to keep it tight. 6) Slide heat shrink tube over layup. I suspect this will be tough. 8) Watch expensive epoxy drip out. 10) Put tube outside on a cold day (0 F). Strike a few times to release, pull Aluminum tube out. Laid up the CF tube using 36" square of CF and 16 squirts of west systems epoxy. I used a heat shrink tubing which I had punched several hundred weep holes into to compress it. This did not work well so I also wrapped it in bleeder ply and used a tight wrapping of packing tape to compress it. PeelPly/BleederPly and Vacuum bagging would have been better. After curing I removed the compressing layers and it was wrinkly. A belt sander will fix that. The next trick was getting the CF tube off of the aluminum form. This morning it was 3 degrees F outside. Cold enough? After leaving the tube outside a while I brought it in and tapped it with a hammer. Part did not fall off. Smacked it on some wood to see if gravity would do some work for me. Hey, it moved! Put it back outside a while then clamped the aluminum tube in my vice and tugged on the CF part. It wasn't easy but it slid off! Yay! 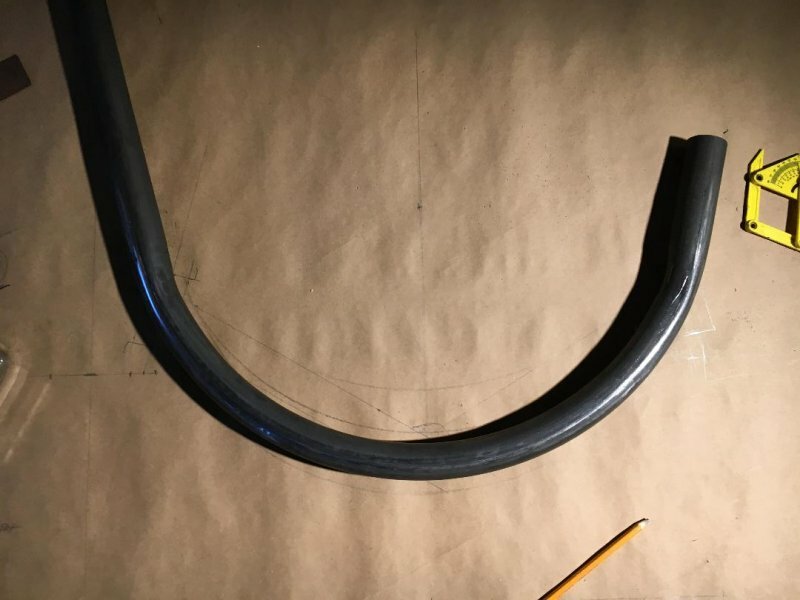 (π * 2) * 3 = 18.8” long carbon fiber strip needed to roll up for a tube. Lay out a flat polyethylene plate big enough to stretch out the fabric. While pulling back on the mandrel to tension the CF fabric, slowly roll the mandrel forward. The squeegee action ( highly technical term ;-) of rolling the mandrel under tension completely saturates the fabric and compacts the fabric. 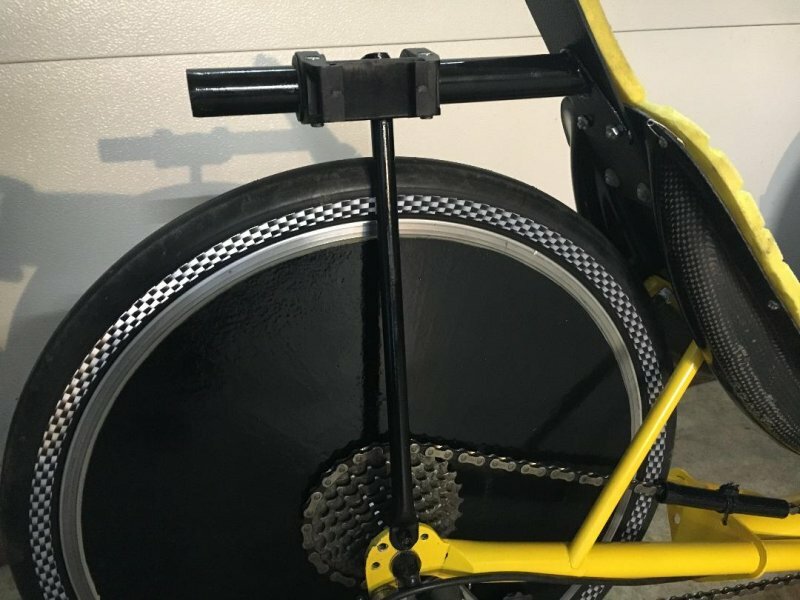 With the carbon wrapped onto the mandrel and fully saturated with epoxy, wrap two helical layers of perforated heat shrink tape around the whole slippery mess! Use red duct tape to fix the end of the heat shrink tape. Leaving the assembly standing on end, heat with the heat gun to shrink the tape. Since the CF fabric was already 90% compacted, the final compaction by the shrink tape will not create noticeable wrinkles. Let cure, unwrap shrink tape, press out the mandrel and voilá! Here's an interesting steering solution. 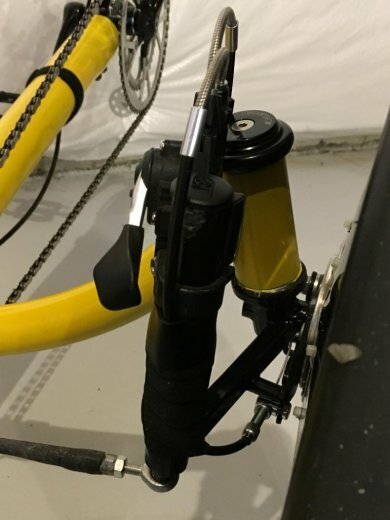 This steering geometry is used by ICE. The odd thing is that there is no traditional Ackerman. 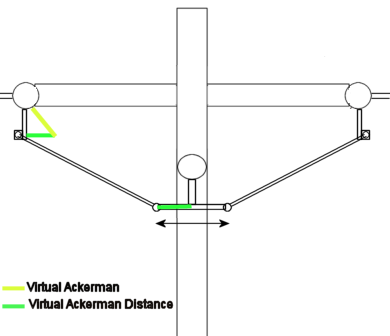 Instead the distance from the steering center to the point where the steering link rod is mounted is the same as the distance between the center of the kingpin and the point where the ackerman arm would attach to the steering link. 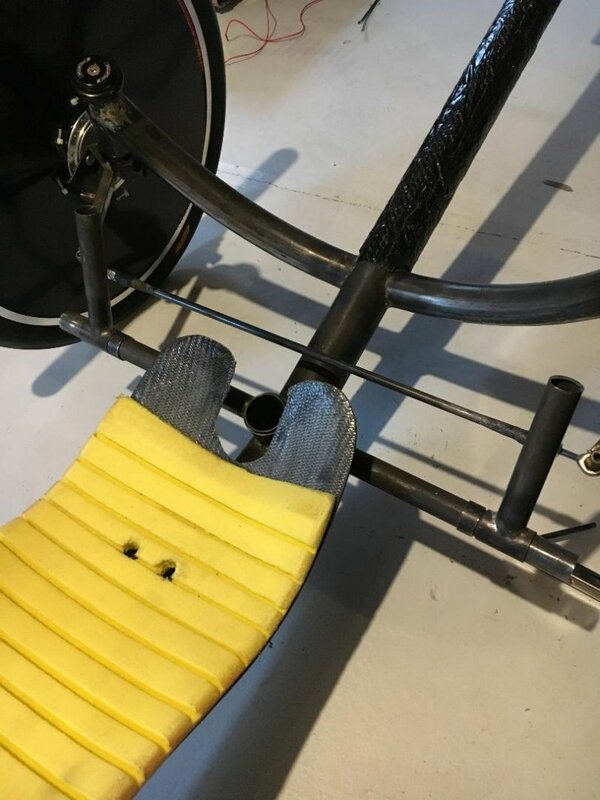 I mounted the seat, and with the seat on I was able to check the family jewels to steering clearance and it is a negative number. Also the ICE style steering would hit the seat anyway. Trimmed the boom tube and added the crank assembly that I had previously cut off the donor bike. 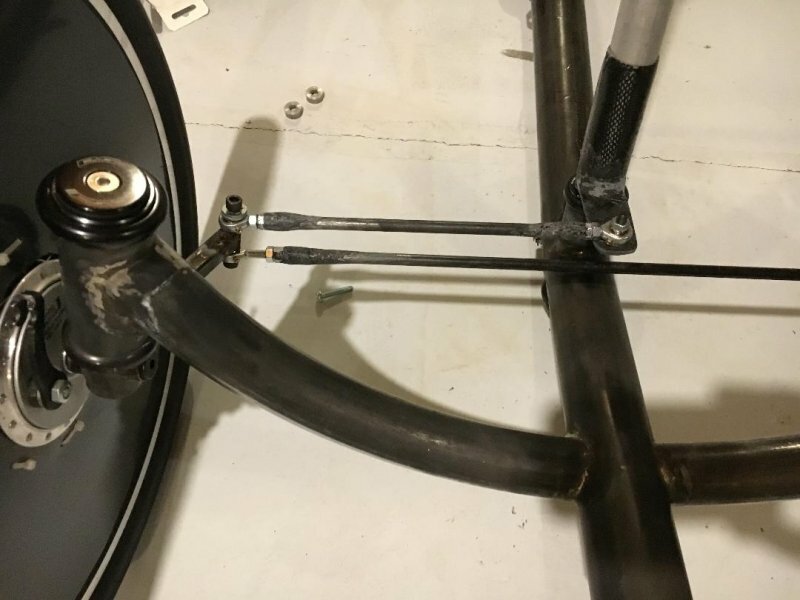 Made the decision to use the side stick steering, which will clamp to the now unused head tube. Added the power side idler and checked the chain line. Looks good! 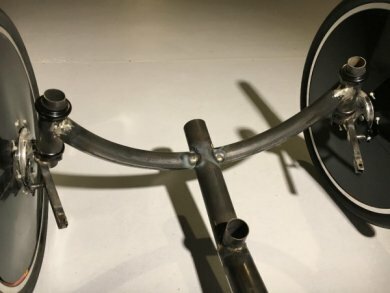 Cut a bunch of tubes and brazed them together to make a side stick steering. Sat on the bike to check the position and clearances. Nope Nope Nope Nope. 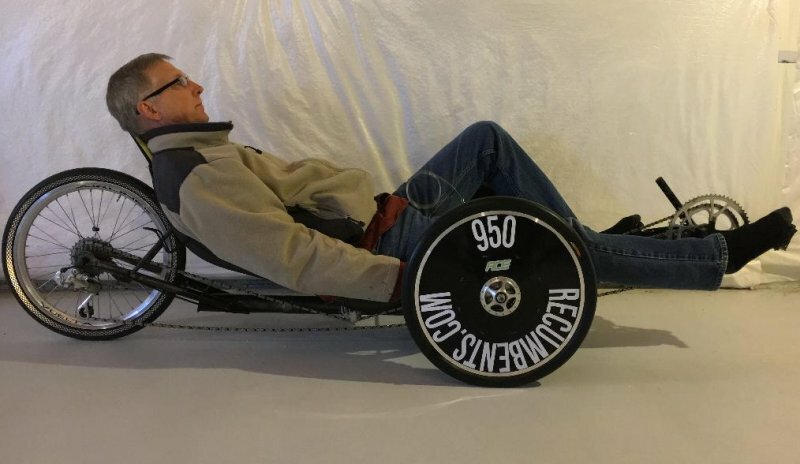 The position feels good and is pretty aero, but my hand would be hit by the tire in a tight turn. 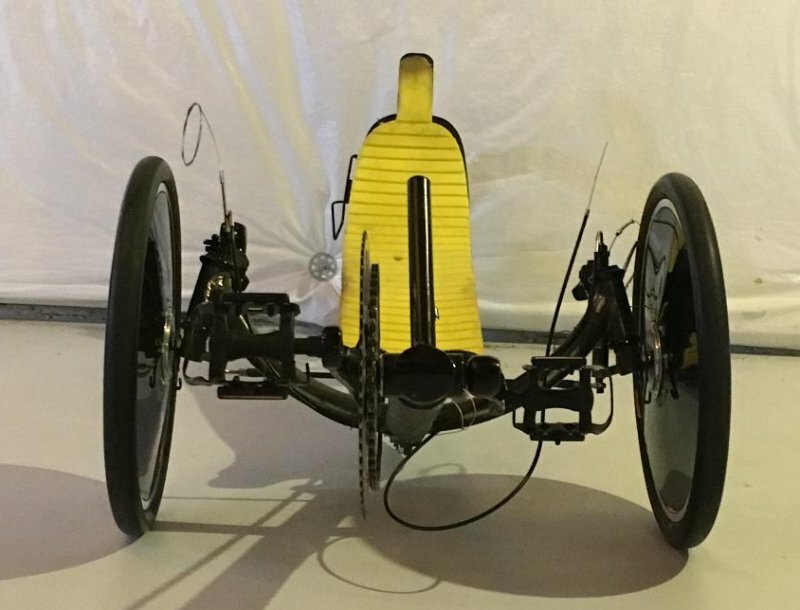 Now I'm noticing that my arms are long enough to have a steering control just behind the cruciform, which would also be a pretty aero position. Back to the drawing board. 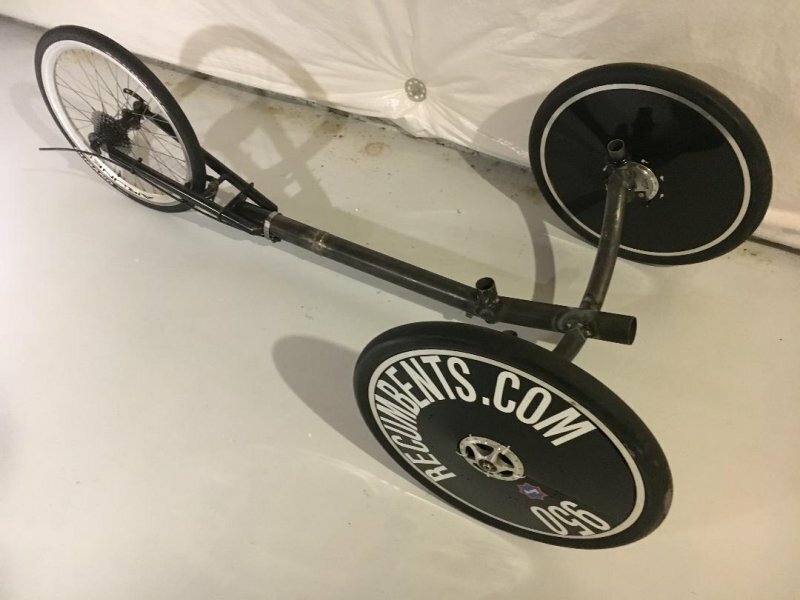 Later I did some experimentation rolling around on the trike in my basement with vise grips on the ends of the ackerman arms. It seemed like direct steering felt ok and it was a good reasonable position for aero as my hands are directly behind the kingpins. I then hacked up the side stick steering and brazed some of the tubes onto the ends of the ackerman arms. Rolled around some more in the basement. It seems good so I'm going with it! As a plus, it's so simple! The only issue is that it won't keep me in my seat in the sharp corners, so some testing will need to be done there to see if body english will be enough. 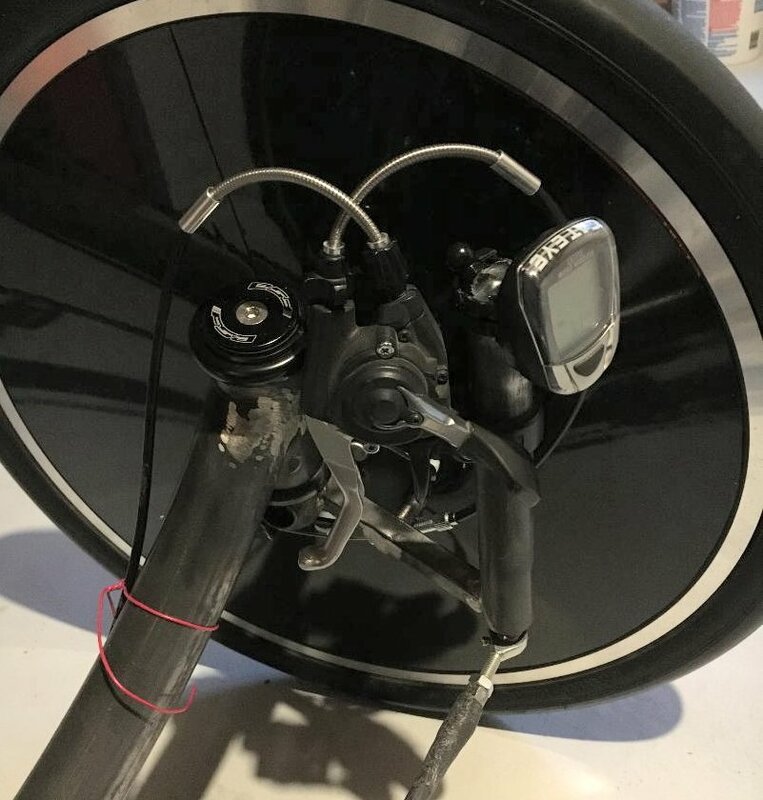 Added brake handles/shifters, speedo, rear derailleur, chain. 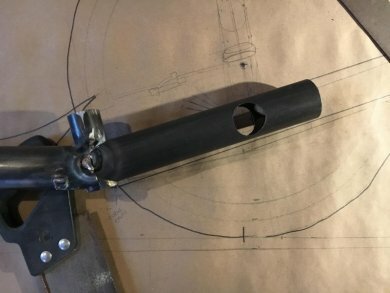 Built CF clamp to attach the CF boom to the steel frame. Rode the bike carefully around the basement a bit. Ordered brake parts. 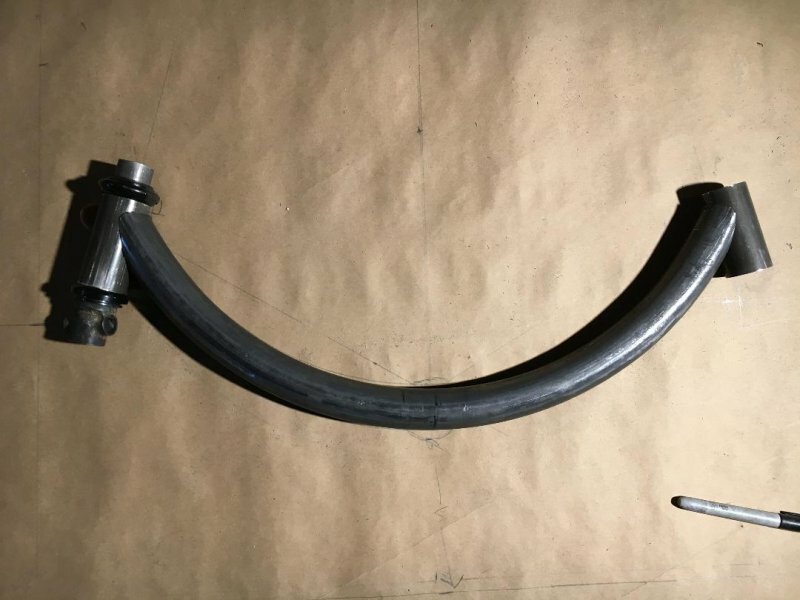 I added the special Sturmey Archer drum brake cable stop and cable clamp brakes parts. Shortest brake cables ever! It's a bit hard to see what's going on but I have enough clearance for my hand except in a really tight turn where the tire will rub my wrist. Time will tell if that's a problem. Completed the CF tubing clamp to hold the boom tube onto the BB assembly. I cut the boom tube an inch or two shorter than I should have but I think there is still enough 2" tube on the BB assembly to allow a good clamp area. Shortened the chain a bit. 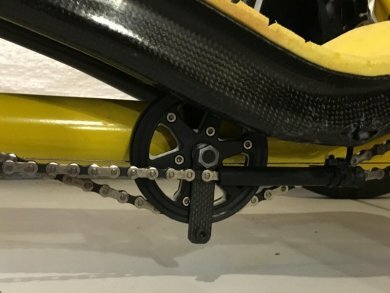 Chain management is completed. I'm using a small Fenner pulley for the power side with a chain keeper. I wanted to use a 16T cog idler but the chain keeper would have been more difficult and more prone to chain loss. 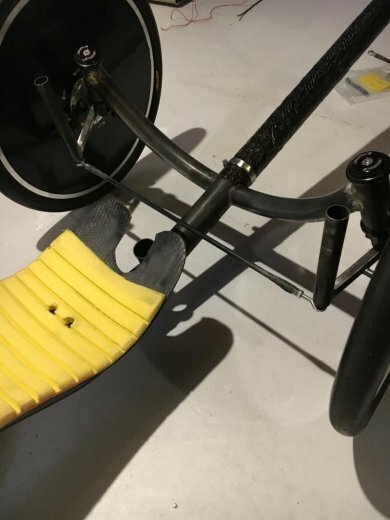 The return chainline is pretty straight so I'm just using a short section of chain tubing connected to the seat. This picture also shows the lower seat mount bracket. I think I'm going to paint it yellow. Here's the front view before finishing the brakes. The handlebars are behind the kingpins. I took it for a couple short test rides. First I had to fix the toe in so it handled properly, then I was able to go faster and noticed that it had some death wobble. I tightened the headsets and that seemed to fix the wobble issue. If it comes back I will replace the CF tie rod with a steel one. 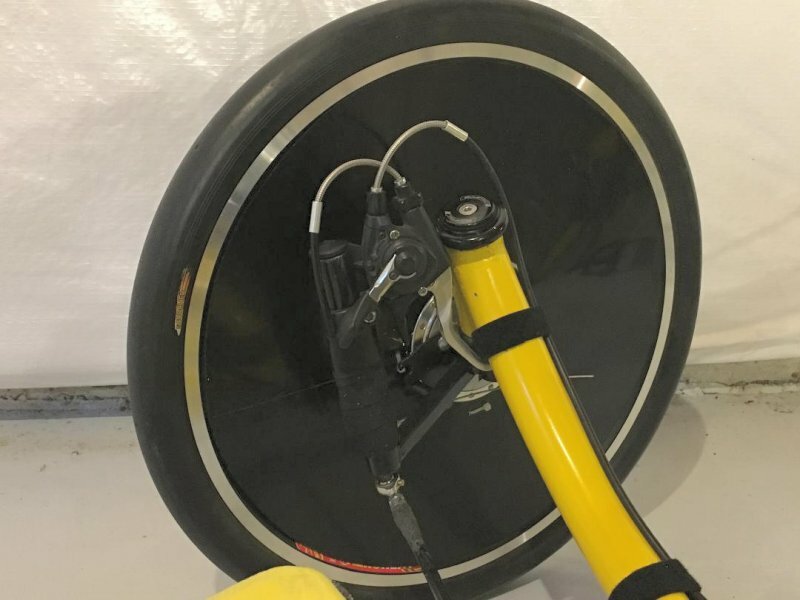 I also fixed the one front front wheel headtube that was in at the wrong angle, just a degree or two off, causing the wheel to be slightly canted. I had to unbraze it, grind it a bit to fix the angle, check the alignment, then tack weld it back together. Still wrong. Second time around it seems right. That plus removing/installing the headset cups about 20 times made for a long day. 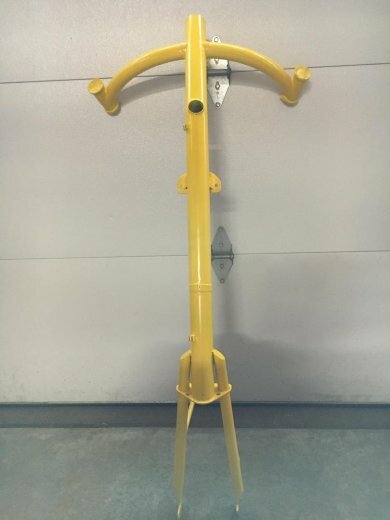 I then painted the frame yellow. Looks pretty nice! Now I'm putting it back together. I'm hoping for a warm day soon to take it for a long test ride! After getting it put back together, I used a couple of boards to check the toe. Yes, too much toe-in! Because I used two right hand threaded rod end bearings I have to remove a bolt to adjust it. Note to self: If I ever abuse myself with a trike build again, get right and left threaded rod end bearings so all I need to do is loosen the bolts to adjust the toe. Later I adjusted the toe-in using the telescoping rod technique described on the trike overview page. Here's the left hand steering assembly. This is the one I had to unbraze and fix. After I had the bike all back together now I notice that the trail doesn't exactly match on both sides. A couple trips around the basement didn't show it to be a detriment. I still need to test it outside. Here's the right hand steering assembly. It's hard to see but I used some handlebar tape to finish off the hand grip. 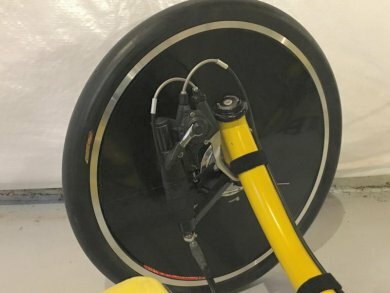 I discovered the the brake cable could be wrapped under the tape. Nice! Later I may drill some hole in the cruciform to route the derailleur cable through so it looks cleaner. 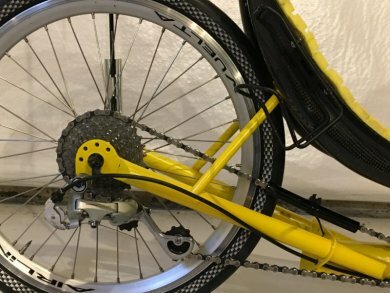 Here's the power side idler and the return side chain tube. The power idler is TerraCycle's "Sport" 23T . Here's the rear end, with another chunk of chain tube to prevent rubbing on the frame in the upper gears. 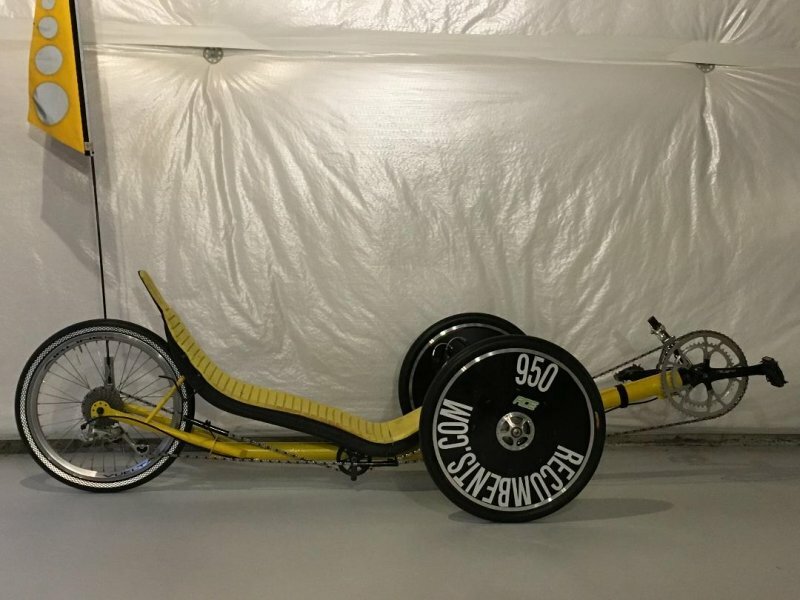 The finished trike, complete with a flag that has been sitting in my garage for many years, just waiting for a trike to put it on. 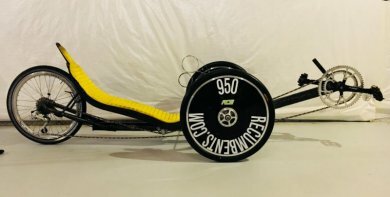 I found some 20 year old fiberglass wheel disks that I made for the Barracuda lowracer that fit the rear wheel nicely. I shot some black spray paint on them and mounted them and now it's ready to go! After several test rides I only found two issues. One was the death wobble which was just because one headset and an axle nut were loose. The other was that due to the handlebars being so close to the kingpins I didn't have enough leverage to easily turn the trike. 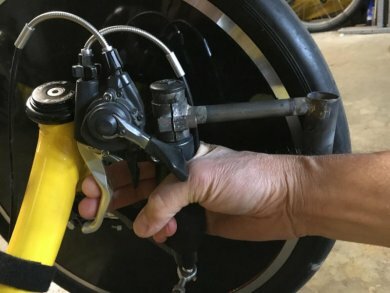 To get more leverage I built some handlebars extensions which I push with the back of my wrist in a sharp turn. Surprisingly it seems to work great. And yes, the trike is very low. I do hit the chain keeper on driveways and such. I made a short video showcasing the trike. Also I decided it needed a bag to put all the crap I need for a long ride into. I have a nice handlebar bag with a quick release which I hadn't ever found a use for, so I built a "rack" for it so I can use it as a single sided pannier. 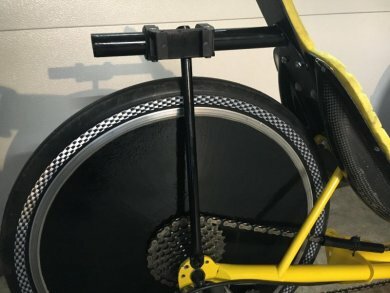 The rack is bolted to the headrest bolts and then has a single tube that angles down to the power side dropout. The handlebar bracket is attached to the main tube. Here it is with the bag attached. 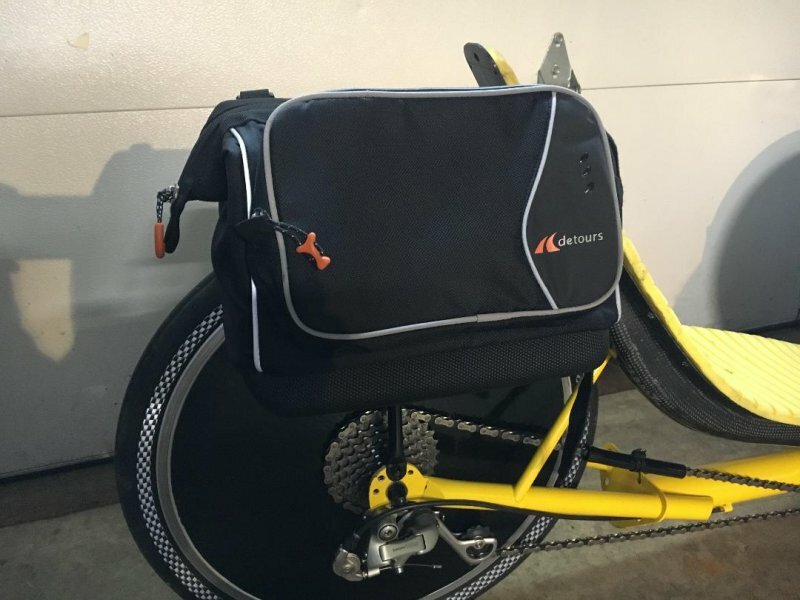 The bag rests against the single leg to keep it from bouncing around too much. I'm hoping I don't get too much road chatter transmitted to the headrest. I have now taken the trike on several long-ish rides. On the flats it loafs along at about 17mph. I'm still acclimatizing to the steering but I think eventually I will automatically compensate for the slight pedaling induced side to side movement. On my bike trail rides I haven't had any issues with the low BB and idler, which makes me happy. No issues with the road chatter but I think I need to cut down the headrest about an inch. 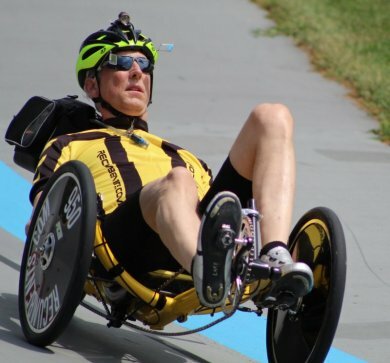 I raced the trike at the Northbrook/Kenosha velodrome races. Now I know why there aren't many trikes at these races. It took a lot of force to keep me on the banked corners at trike speeds. And speaking of speed, it wasn't great. That's ok because I wasn't expecting speed. The trike did perform well. Later I took the trike to the Indiana races where traditionally there are more trikes. I was not disappointed and was able to race with other trikes on good trike courses. I didn't go fast there either and finished about mid-pack. It wasn't the fault of the trike though, it was the engine (me! ).